It was supposed to be simple: Syrian President Bashar al-Assad's days in power were numbered; the Nusayri (Alawite) man would be toppled by Syria's Sunni majority in a popular revolt. The Sunni majority would set up in Damascus a Muslim Brotherhood type of regime that would be subservient to Ankara, and Turkey's southern border with Syria would be now be a borderless Sunni "Schengen" zone; cross border trade would flourish with the free movement of labor and capital. Peace would prevail along the 900-km border, and Turkish and Syrian Sunni supremacists would advance their agenda in the not-always-so-Sunni lands of the Middle East. Today, instead of the free movement of labor and capital, there is, around the border area, the free movement of bombs and bullets. Turkey's miscalculated foreign policy on Syria has led to the creation of a neighboring Peshawar (Afghanistan) across its border. Turkey's Islamist rulers were unhappy with Assad as their neighbor. Their efforts to unseat Assad have dramatically resulted in creating even less pleasant neighbors: an unknown number of jihadist groups, the Islamic State of Iraq and Syria (ISIS) and Kurdish militants fighting to create an autonomous enclave. Instead of a predictable Assad, Turkey faces an assortment of unpredictable, violent groups too unwieldy to control. Instead of a predictable Assad, the Turkish gambit has resulted in having as next-door neighbors an assortment of unpredictable, violent and alien groups too unwieldy to keep under control. After the Syrian Kurdish militia, PYD -- which has links to the Turkey-based PKK, the outlawed Kurdish group that has fought a violent war for an independent Kurdish state since 1984 -- took over the northern Syrian town of Tel Abyad from ISIS, Ankara did not know if this was good or bad news. For Turkey, ISIS is "officially" a terrorist organization. But it is an open secret that Ankara has supported ISIS in its campaign for the downfall of Assad and the formation in Syria of an Islamist regime. 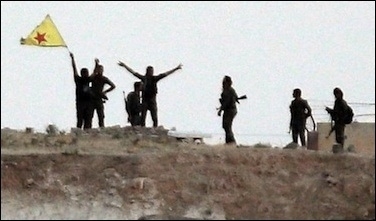 Fighters with the Kurdish People's Protection Units (YPG) celebrate after seizing Tel Abyad, Syria from ISIS on June 15. Immediately after Tel Abyad fell into the hands of Kurds in late June, ISIS jihadists staged bomb attacks, killing over 200 Kurds in Kobane, a Kurdish stronghold in northern Syria. Figen Yuksekdag, a leader of Turkey's pro-Kurdish People's Democracy Party (HDP), said that, "There is a high probability that Ankara facilitated the attack." She added that Turkey has for years supported ISIS. Turkey's government vehemently denies that. We will never allow the establishment of a [Kurdish] state in Syria's north and our south. We will continue our fight in this regard no matter what it costs... They want to complete the operation to change the demographic structure of the region. We will not turn a blind eye to this. Once again, Turkey's threat perceptions are deeply divergent from its Western allies'. Ankara considers the real security threat from Syria as not the jihadists, but the secular Kurds who fight the jihadists. There are reports that the government has ordered the military to prepare for cross-border operations in order to destroy the Kurdish enclave -- siding, therefore, with ISIS, which also wants to destroy the emerging Kurdish enclave in northern Syria. In Ankara's view, the real security threat from Syria is not the jihadists, but the secular Kurds fighting them. Turkish Foreign Minister Mevlut Cavusoglu said that any cross-border operation into Syria would be discussed at a meeting, which took place June 29, of the National Security Council. After the four-hour meeting, a statement from the Council said that the efforts aimed at a demographic change in Syria [in favor of Kurds] were worrisome. Once again, the Turks openly tell the world that they view the secular Kurds more of a security threat than the jihadists. The Turkish military, generally known for its hawkish stance on the Kurdish issue, is surprisingly (and realistically) opposed to a cross-border adventure to smash the Kurdish enclave. A senior general told this author on June 25: "We have warned the government about possible costs [of such an operation]. If they give us orders for an operation, supported with perfect domestic and international legitimacy, we will act. In any case the government should be responsible for any breach of domestic or international law, and/or for the political consequences." This means that the Turkish government is preparing for an illegitimate military operation in Syria, although it probably will fail to initiate it for legal and logistical reasons. Against whom would the Turkish army be fighting in such a deeply contested territory? Who are its friends and foes? How would a cross-border operation be logistically supported? How would the ruling AKP party justify Turkish casualties, especially at a time when it is trying to compromise and form a coalition government after it lost its parliamentary majority for the first time since 2002 in June 7 elections? Turkey has worked so hard to create a "Peshawar" across its border with Syria -- hoping instead to create a Muslim Brotherhood zone. It has its own cross-border "Peshawar" now. It just does not know how to deal with it.